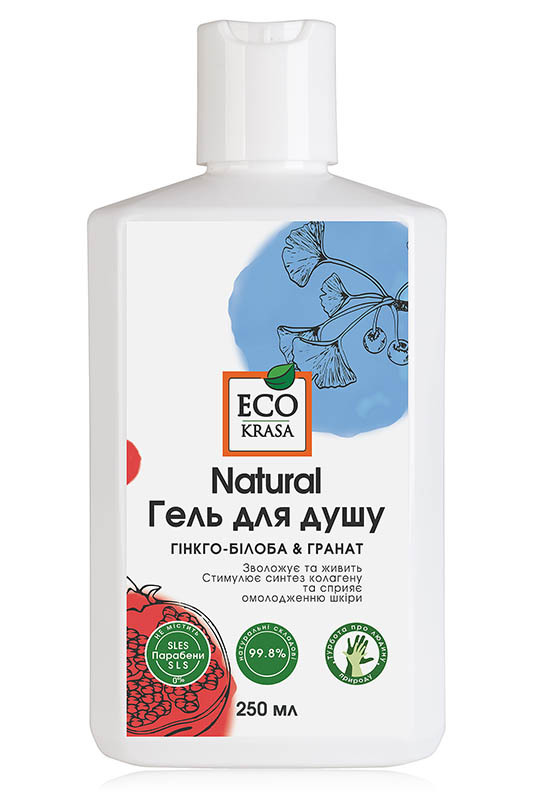 Ukrainian beauty brand EcoKrasa presents Ginkgo & Pomegranate Shower Gel. It effectively removes dirt and grime, moisturises and nourishes the skin, and stimulates collagen synthesis. Free of SLS/SLES and parabens. Contains 99.8% natural ingredients. Key ingredients contained in the product include avocado oil, vitamins, squalene, pomegranate extract, ginkgo extract, ylang-ylang essential oil, and grapefruit essential oil. The shower gel is based on plant-derived surfactants with a mild effect, which clean the skin without drying it out. Avocado oil, squalene and vitamins A and E have a strong moisturising and anti-age effect. They help to keep the skin hydrated, make it softer, and improve skin elasticity. Squalene also has an anti-inflammatory effect. It soothes irritated skin and helps to lock in moisture. Pomegranate extract is a strong antioxidant. It neutralises the harmful effects of free radicals and prevents premature skin ageing. Ginkgo extract stimulates collagen synthesis and has a pronounced antibacterial effect. Ylang-ylang and grapefruit oil are valued for their aromatherapeutic properties. They give a mood and energy boost, as well as relieve stress and fatigue. Ingredients. Aqua, Cocamidopropyl Betaine (mild plant-derived surfactant), Plantapon PSC* (mild plant-derived surfactant), Genagen 3 SB (mild plant-derived surfactant), Plantacare 818* (mild plant-derived surfactant), GlucaTain Plus* (mild plant-derived surfactant), Nipaguard SCE* (natural preservative), Lamesoft PO 65* (lipid layer enhancer, emollient), Xanthan Gum* (natural emulsifier), Citric Acid, Punica Granatum (Pomegranate) Extract, Ginkgo Biloba Extract, Persea Gratissima (Avocado) Oil, Dehyquart Guar N* (conditioning ingredient), Hypoallergenic Fragrance, Citrus Paradisi (Grapefruit) Peel Oil, Cananga Odorata (Ylang-Ylang) Oil, Natural Food Colorant. Want to buy Ginkgo & Pomegranate Shower Gel? Call us or submit your order via our web site! EcoKrasa is a Ukrainian beauty brand launched in 2017 by Natura Organica, a well-known Ukrainian cosmetic manufacturer. The company produces high-quality natural cosmetics that meet European quality and safety standards. Its products contain ECOCERT-certified plant ingredients and are completely safe for human health and the environment. The brand’s name, EcoKrasa, can be literally translated as EcoBeauty. The word “eco” emphasizes compliance with strict quality standards, and the Ukrainian word “krasa” (“beauty”) symbolises the company’s desire to produce high-quality cosmetics in Ukraine and for Ukrainian consumers. EcoKrasa cosmetics are formulated with mild plant-derived surfactants and infused with natural oils and extracts, including ginkgo extract which is valued for strong antioxidant properties. They are suitable for all skin types, including dry and overly sensitive skin, and can be used daily.